Face it, we've all got about as much reality as we can handle these days. Escape to a land where good guys win, love is steamy and you never have to mow the lawn. 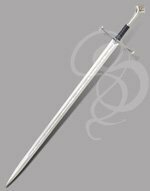 The Falchion is the perfect for any Gitan or other warrior cast in the Saladin mold. Made of high quality steel sharpened to a razor's edge. 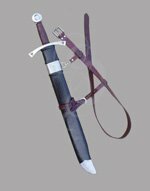 It includes a beautiful leather wrapped wooden scabbard with carrying strap. 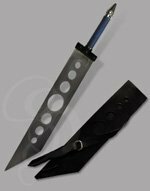 Mithrodin by Kit Rae features a malevolent 24-inch J420 stainless steel blade and solid, antiqued metal hardware. The grip is wrapped in a supple leather for great grip and a truly sensuous feel. 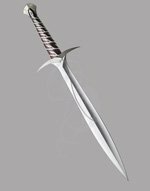 Lord of the Rings Hobbit Glamdring The blade of Gandalf The Grey. 47 5/8" overall. 35 1/4" AUS-6 stainless blade. Cast metal handle with leather wrapped grip and simulated gemstones. The Officially licensed Lord of the Rings Hobbit Sting. The blade of Bilbo Baggins. 22 1/4" overall. 15 3/8" AUS-6 stainless blade. Solid metal guard and pommel. Wooden wall display plaque with wood grain finish and silk screen graphic. 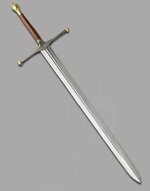 Glamdring, eventually the sword of Gandalf, has a long and distinguished history in Middle Earth. 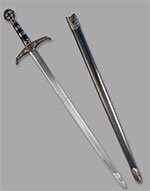 Narsil and Anduril (swords of the Numenorean kings)are perhaps the only swords that can match Glamdring's pedigree. Glamdring, whose name loosely translated means 'Foe-hammer', was forged by elves in the first age. 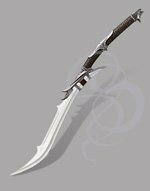 Many people believe that elven-forged blades shine with an internal light; Glamdring is no exception to this belief. It was said to shine with a powerful light -- sometimes white, sometimes blue and ocassionally red -- when foes were around. Perhaps its greatest claim to fame is that it was weilded by Turgon, one of the most powerful elves to ever live. Turgon, you'll recall, was the King of Gondolin, the only soul to ever hold that title. He used Glamdring throughout his reign, in various battles against Morgoth and his legions. 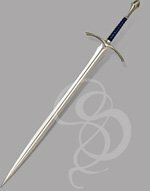 The sword was lost and Turgon killed when the Hidden City of Gondolin was sacked. The weapon disappeared for centuries afterwards and was thought lost when the world was changed by the wrath of the Valar. It popped up again in The Hobbit, in the possession of three trolls that the wizard Gandalf dispatched. 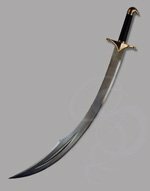 The sword was found in their possession, along with Thorin Oakenshield's sword Orcrist and Bilbo's sword (later, Frodo's sword) Sting. 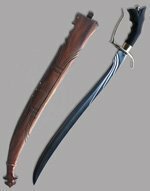 All three of the weapons were elven, and Orcrist is said to have been Glamdring's twin. 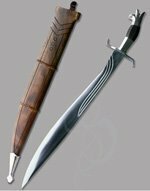 Both swords (Glamdring and Orcrist) were forged in Gondolin, and one was known as Biter and one as Beater among Goblins, who feared both swords equally. Gandalf took Glamdring as his own when he turned the trolls to stone and brought it to Elrond. 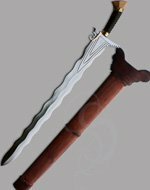 Elrond examined the sword and told Gandalf that it was indeed Glamdring, forged in Gondolin and once weilded by King Turgon. Gandalf wore the sword for the rest of his days. His first real use of the sword was in killing the Great Goblin in the caverns of the Misty Mountains when he saved Bilbo Baggins and the troop of Dwarves led by Thorin Oakenshield. It's most notable victim was probably the Balrog of Moria, whom Gandalf slew in the epic battle that ensued while he was leading the Fellowship of the Ring through Moria. He also used the sword in several battles during the War of the Ring, including the final battle. It is believed that Gandalf took Glamdring with him into the West when he left Middle Earth.